Ogi"- Little Kyoto" SUBPAGE | All Japan Kyoto Association"
As the name of the town suggests, “Ogi” literally means a “small castle,” as there used to be a magnificent castle in this region which unfortunately doesn’t exist anymore. However, strolling around the city will remind people of the olden days. The town was developed following the layout and design of Kyoto in those days. Come and see Ogi’s pure stream and the fireflies who make it their home along with the beautiful flowers that entertain people in every season. Ogi always welcome everyone with its simple yet lovely natural environment. 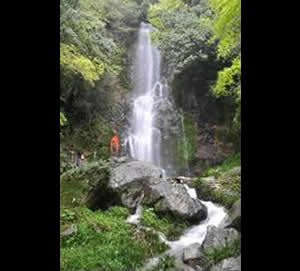 This waterfall, 13 meters in width and 75 meters high, was selected as one of the 100 Best Waterfalls in Japan. 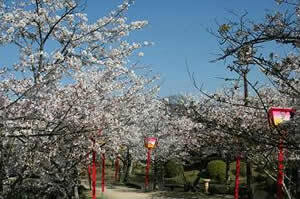 3,000 cherry trees reach their best blooming time in late March to early April. The park has been selected as one of the 100 Best Cherry Blossom Viewing Sites and Historical Parks in Japan. 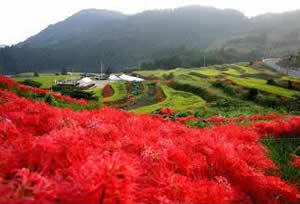 In late September, the vivid red of spider lilies surround the rice terraces. One of the 100 Best Idyllic Scenery Sites and Rice Terraces in Japan. 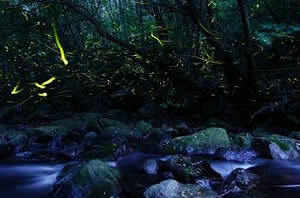 Late May to early June is the time for watching the superb dance of fireflies on the Gion River. One of the 100 Best Villages with Idyllic and Natural Scenery in Japan. 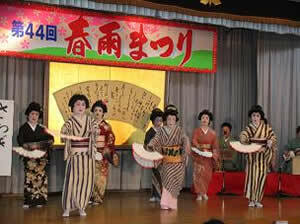 A festival is held during the peak plum blossom period. 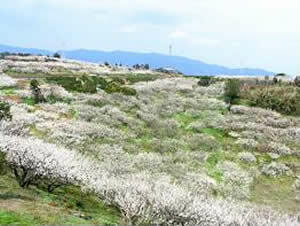 10,000 plum trees will welcome and entertain visitors. “Harusame” is a short song composed by the Japanese literature scholar, Hanamori Shibata, who was born in Ogi Town. The elegant dance by geiko with the song as an accompaniment is fascinating. 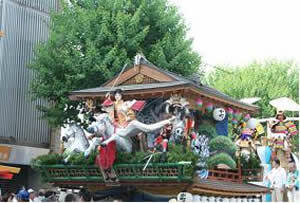 A summer festival held by Suga Shrine with a history of over 600 years. Three large floats being pulled around the town is a must-see. This is part of the Spider Lily Festival. 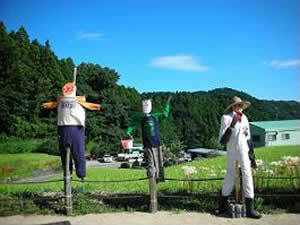 A number of unique scarecrows will be set in the rice field. A scarecrow contest is also held. Kiyomizu Waterfall is one of the top highlights of Ogi Town. 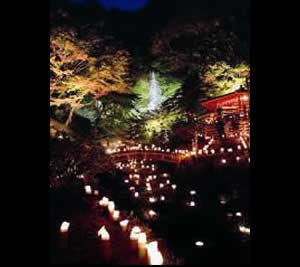 Colored leaves are lit up and about 10,000 bamboo lanterns are set along the path. 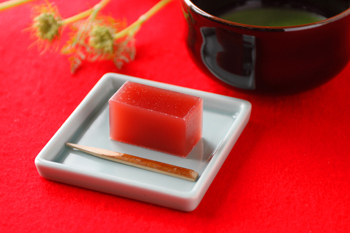 Yokan is a traditional Japanese sweet. Sweetened red bean paste is shaped into a bar. A simple taste of Japan born from the natural environment of Ogi. 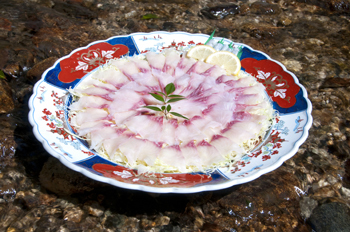 Koi carp raised in the cold stream of Ogi are one of the specialties of the area. Full of nutrition, koi cuisine is good for avoiding summer weariness. 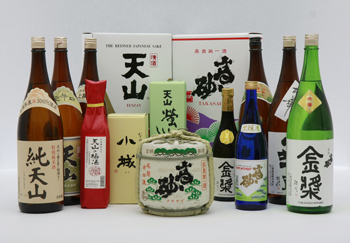 Since Ogi is blessed with top quality spring water and rice harvested in Saga Field, sake brewing has been an important local industry since olden times. “Majenba” is a new noodle dish born in Ogi and a variety of Majenba are served at many locations throughout the town. One simple rule is that a Majenba must include at least one local specialty from Ogi as a topping. 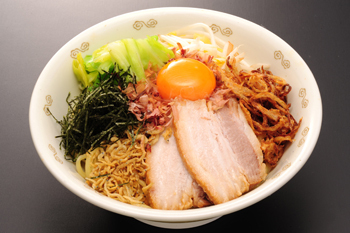 Toppings, noodles and a special sauce are all stirred together in a bowl and enjoyed.